The mule deer population is on the rise as a result of good spring moisture for the past three years. The doe:fawn ratio has shown a favorable increase in the last two years, leading biologists to take notice. 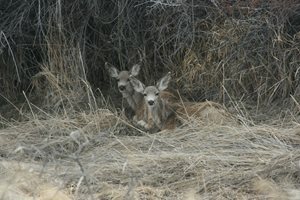 Early spring moisture impacts wildlife fawn production most significantly. The moisture received during those months contributes to nutritious forage production at a time of year when wildlife need it the most-after a long Wyoming winter. Mule deer emerging from winter with good spring forage can recover necessary fat reserves for fawn rearing. Likewise, shrubs produce nutritious leader growth as a result of spring moisture which will prove to be a vital food source during the subsequent winter for mule deer on transition and winter ranges. Even when it isn’t raining, Game and Fish is working to increase mule deer populations through the Wyoming Mule Deer Initiative. The Initiative works with partners to improve our understanding of limiting factors to mule deer population growth including identification of key habitats necessary to sustain populations and implementation of habitat improvement projects within key mule deer herd units statewide. To learn more about mule deer efforts in Wyoming, visit the Wyoming Mule Deer Initiative website.